"With Tsipras in Greece and with us in Spain, the power conditioning the ECB’s actions will be very strong. We need to build an alliance of southern countries, as change in one state alone is impossible. If Tsipras wins in Greece then we can begin to build a southern alliance to stop austerity." A year ago he was a well-known TV pundit, a young university professor at the Madrid Complutense nicknamed el coleta (on account of his pony tail). 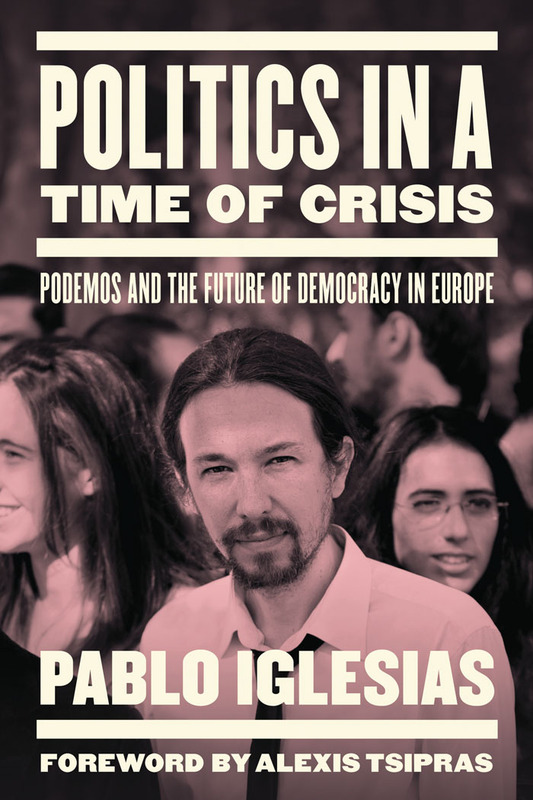 Today the 36 year old Pablo Iglesias is the newly elected general secretary of what the surveys are calling the biggest party in Spain: Podemos, ‘We Can’. A movement that had five MEPs elected in May’s European elections, appearing with a radical Left programme but simultaneously rejecting this label and upending the classic schemas: ‘because the word “Left” is a metaphor inadequate to these times’. 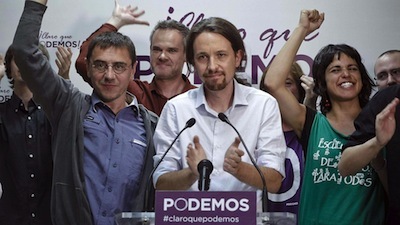 Podemos was born only ten months ago, and now PP and Socialist voters are flocking to it. How was this possible? In Spain we are living through an exceptional situation, with the economic crisis that has become a political and systemic crisis. We in a sense represent a solution to this problem. The indignados movement demonstrated that there was a social consensus: rejection of the caste and anger over corruption were strong but they had still not translated into an electoral response. Indeed, the main parties mocked the movement: ‘You’re angry? Then why don’t you put yourself forward for election?’ Now they’re not laughing any more. Are you opposed in principle to all governmental collaboration with the other, traditional political forces? We are an open movement where which anyone can put themselves forward as a candidate, even people from other parties. I am not in favour of a Left front; that would be a mistake. Our goal is to achieve a popular unity, and that goes beyond identities. It will be the programme that counts: are the Socialists ready to change themselves, not bowing their heads to Germany’s diktats? And what about restructuring public debt, for example? It depends on that: we are no sectarians. And what do you think about the Catalan and Basque demands for independence? We are for self-determination, each citizen should be able to decide on each question of her own life. That said, in Spain we need a new constitutional process where we address the theme of sovereignty and rights. Personally, I am for a plurinational country, I don’t want Catalonia to leave Spain. But then, who am I to decide for them? If you win the elections will Spain leave NATO? Absolutely yes, it is not an easy step but if we want to get our sovereignty back, including our military sovereignty, then we have to say no to foreign soldiers’ presence on our soil. And what about the Eurozone? Do you want to leave that, too? Currently it is not possible for us to leave the Eurozone. In order to change the current situation we have to start again from Maastricht: many mistakes were made back then that have brought us to this Europe of inequalities, where we find ourselves as Berlin’s colonial subjects without social rights. But with a people’s government in Greece… our strategy is continental. Neither Right nor Left, the fight against the Caste and its privileges, mass use of the Web. Are you the Spanish equivalent of Grillo and his followers? I am a man of the Left. But Bobbio has already reflected on the problematic nature of using these words. We propose an emergency government that puts some very simple questions back on centre stage: schooling, health, homes for all. We have some affinities with the Movimento 5 Stelle (M5s) and do things together in Brussels – but no, we’re not the Iberian M5S. Do you like Matteo Renzi? He is a great communicator but in his practical actions he carries out the same policy as his predecessors. He does not really challenge austerity or tax havens. He is a representative of the Wall Street Party, making reforms together with Berlusconi. Who’s happier than anyone. Will you be the candidate for prime minister in 2015? We’ll do online primaries, as we always do. I am available, but as the Atletico Madrid manager Cholo Diego Simeone says, let’s see how it goes, one match at a time. One last question: what are your cultural points of reference? Gramsci and Marx, for sure. After Hobsbawn’s death I’m really getting into Perry Anderson, former director of the New Left Review.